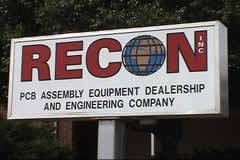 Recon.inc an industry leader in pre-owned SMT & PTH assembly equipment sales was founded in 1997. Dealership of SMT - PTH & ATE equipment in North America. President & Ceo of both Corporations is Thomas L Gizzi..
Mr. Gizzi has Engineering , sales, and business management back rounds in the Electronics Assembly industry. Recon.inc along with the wholly owned subsidiary Recon Technical Services (RTS) provide a comprehensive approach to equipment sales. Encompassing process planning through post sale support and long term preventive maintenance contracts and warranties. Recon / RTS both housed in our 50,000 sq ft. facility sell all equipment directly off our show room floor. Recon Sales carries a large inventory of used, preowned and refurbished MPM screen printers, including AP-25 HiE, UP-2000, MPM screen printer, MPM printer, Accuflex, AP-36, UP-2000 HiE, and more. MPM Printers: AP-25 HiE, UP2000, Accuflex, AP-36. MPM spare parts. Mpm Cognex vision systems. Recon sales specializes in MPM screen printers and MPM printers.